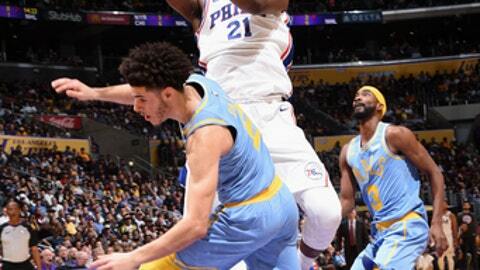 LOS ANGELES (AP) In a matchup of teams with rising young stars, Joel Embiid stood out above the rest. The 7-foot center scored a career-high 46 points – the most by a Philadelphia player in 11 years – and grabbed 15 rebounds to lead the 76ers past the Los Angeles Lakers 115-109 on Wednesday night. ”Tonight we realized we had Joel Embiid, and he was just dominant,” said Sixers coach Brett Brown. ”I was just playing basketball and being aggressive, just like I was against the Clippers,” said Embiid, who played 31 games last season and averaged 20.2 points in his NBA debut. Lakers: Ball entered shooting just 31.3 percent from the field, including 25 percent from 3-point range. The No. 2 pick in this year’s draft has a strange jump shot, but Walton said the team has no current plans to change it. ”We’re not even talking about changing it during the season. We may not change it at all ever. He’s been a good shooter his whole life and he’s going to start making shots. That’ll come with time,” Walton said.